We enter on the right side of the store to find the vast produce department. New flooring from Key Food is seen here in the produce section, along with the famous canvas boxes we have all learned to love from A&P (Although they are actually not canvas... or even boxes for that matter. I'll cover that in a later post.) with the notable pictures of fruits, vegetables, and other products, depending on the department. Key Food also decided to keep the green banners on top of the produce cases, which showcase old A&P stores and products. The seafood department not being used for much fish dinners today... unless you want some chips with your... oh wait, there's no fish. Something interesting that I noticed about the panels used in the Fresh 1.0 decor is that there are a few styles of it. You can see here that A&P used a 'fresh' logo with a Waldbaum's leaf on top. Other variations include the 'A&P fresh', and a generic version with no writing at all. Standard wood-slat aisle toppers seen here. They were a staple in early fresh remodels and A&P's bland early 90's decor. It's amazing how long these have lasted, and how many are still being used. Key Food is still using the original aisle markers from A&P in this store. This store has 14 aisles, with dairy being the last, as seen here. I don't know if this was normal for Waldbaum's when they were open, but packaged cheese and dairy are seen in the cases here... which is a little bit odd for me. I'm used to seeing the coffin cases for dairy. Ah, the standard, bland A&P front end. Key Food added a seating area which took up around three more registers. The titling seen on the "Thank you..." sign is new from Key Food. This has to be the best thing they've ever done on an A&P-acquired store, as other owners of Key Food stores in New Jersey tend to (what I call it) 'open the store in a day', basically just putting the products in the store, and opening. The owners of this store actually spent some time on it, and made it great. Glad to see some new stores being successful! Here's to the new Superfresh of Staten Island! Thank you Supermarket Fan for treating us with a tour of this awesome new store! The dairy cases were always upright as far as I know, since there isn't much room in the last aisle for coffin cases. They would have had to have one fewer aisle, and with only 14 to begin with, that's not much. And I'm not sure I agree with what you said about the "opening the store in a day". This store felt like it was opened in a day, with no substantial changes except the café in place of self-checkout and the new flooring. Excluding the two that have closed, the NJ Key Food/SuperFresh stores have received far more attention than this has. 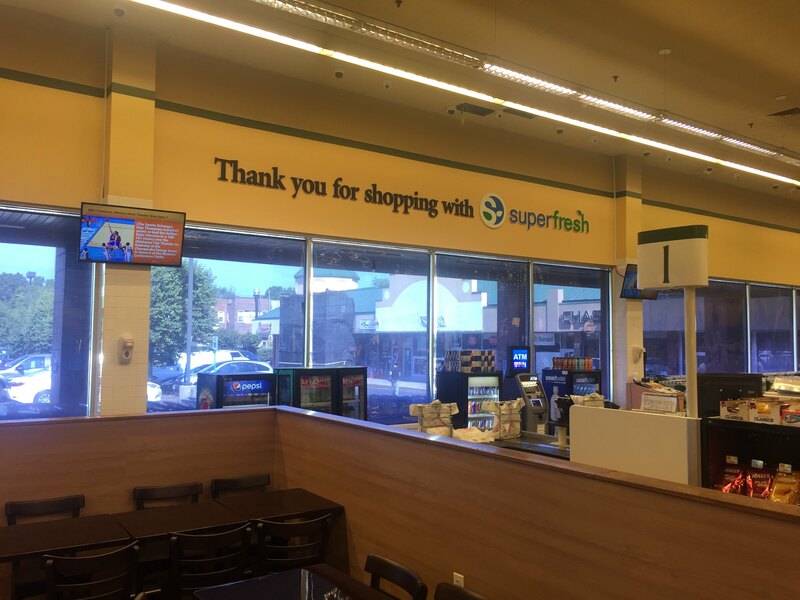 The SuperFresh stores in Belleville, Bloomfield, and Irvington got totally new decor, seafood departments, produce cases, and registers. Belleville/Irvington also got new international departments, and Belleville got a liquor store. Bell Farms in Belleville, SuperFresh in Glen Rock, Paterson, and Fairview and Gala Fresh in Passaic were all Food Basics. They all had their service departments reopened, plus new decor in all five. SuperFresh in Roselle was a total gut. Gala Fresh in Paterson is being renovated now. Granted, some of them opened first and then were renovated while open, but since this store opened, the seafood department, juice bar, and floral department have all closed. I wish it weren't the case, but this store can't last much longer. No problem! I noticed a lot of blurry ones... but it didn't really make a difference anyway. Most of your pictures were fine. I completely forgot about Master Choice! I thought there had to be a good reason to do it! Why waste money on a sticker with no purpose? I agree, the last aisle doesn't look like it has enough room for coffin cases. I think that this store could've done with 13 aisles, I mean still, 14 isn't that much, but it's practically one aisle. You can fit a lot more in the coffin cases. I agree about your position on the 'opening the store in a day'. I meant more of that nothing has changed (practically). NJ Key Foods do get the new service department decor (partially), but a lot of the old decor is still left in the store. I feel that a lot of stores that Key Food opens with the A&P-acquired banners fail immediately because Key Food doesn't have their act down. I'm not sure if it was you I was talking to on another blog, but I was saying that Key Food still hasn't really done brand separation... they shouldn't be using the new banners until the Urban Meadow brand and separate circulars are completely out. It's painful to see how this is run now. b) call ALL of their stores Key Food. Or SuperFresh. Or whatever they want, but just keep it consistent. And the introduction of the Urban Meadow brand just makes things more confusing. That should have been done long ago...or in the future. The A&P Key Food acquisitions have been most successful in urban areas with strong owners. I'm thinking of SuperFresh in Irvington, SuperFresh Food World in Belleville, and Farmboy SuperFresh in Paterson. They are all excellent stores but only because their owners and management are strong. Yep, I agree with the strong owners part. Stores in Edison and Garwood were barely open for a year-- or even six months. It's a waste of time and money. The stores that are most successful seem to be (I'd say), almost untouched from the A&P days, and people who need a supermarket in the area, similar to the situation in Plainsboro. Key Food better play it out right in Plainsboro, because that store WAS a Superfresh beforehand.